Daily Mirror - Should culprits be charged under Anti-Ragging Act or for attempted murder? Should culprits be charged under Anti-Ragging Act or for attempted murder? How do you describe a group of senior students forcibly taking freshers to an isolated house in the dead of night, stripping them naked, and assaulting them for no reason? Aren’t they brutal criminals? Why should they be described as raggers just because they are university students? But that is how things stand. Fifteen Peradeniya University students were arrested last week at a house in Galaha while they were allegedly torturing the freshers under the guise of initiating them into university life. The police raid is said to have been carried out around 1.00 a.m. on February 20 and the perpetrators, found to be senior students of the Agricultural Faculty, were arrested red-handed and eight injured freshers admitted to the Peradeniya Hospital. One can imagine the level the seniors had stooped to by even renting a house for Rs.10,000 a month for their dastardly deeds. The rental is higher than a student’s Mahapola scholarship grant. It is surprising to note that the university authorities have been unable to stop this beastly habit of ragging freshers by senior students that has been continuing for the past several decades. Even more surprising is the deafening silence by the champions of students’ rights -- the Inter University Students Federation (IUSF) commonly called by the university students as “Anthare,” Janatha Vimukthi Peramuna (JVP) and the Front-line Socialist Party (FSP). One can imagine their response if some outsiders had taken these same freshers to a private house and tortured them. They would have obviously taken to the streets in their thousands, surrounded the University Grants Commission (UGC) and even launched a fast unto death outside the Fort Railway Station, forcing the authorities to arrest the culprits or punish them, as the case may be. The response by student bodies and political parties which rely on students’ support is an indication of their attitude towards ragging. One might recall at this moment that these student unions and political parties have never raised their voices against ragging even when those subjected to ragging had committed suicide, maimed or had given up their studies at State universities and joined private universities purely to avoid this inhuman indulgence in ragging. There has been no news of these so-called student-rights champions visiting the latest victims of ragging either at their homes or at hospital. We have also not heard of any of them commemorating the memories of S. Varapragash of the Peradeniya University in 1997, Kelum Thushara Wijetunge of the Hardy Technical Institute in Ampara also in 1997 and D.K. 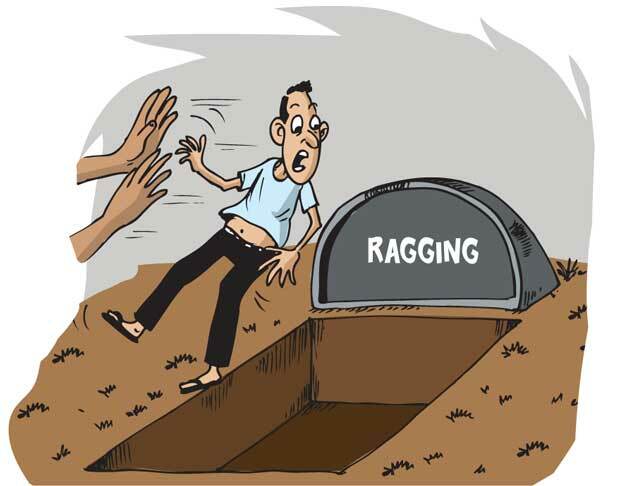 Nishantha of the Peradeniya University in 2014 -- all victims of ragging. But they are known to commemorate the memories of Weerasuriya of the Peradeniya University and Susanth Bandara of the Ruhunu University who were allegedly killed by the security forces or the police during student protests in 1976 and 2010 respectively. In March last year, 17 senior students, of the Allied Health Faculty of the University of Peradeniya, were suspended on charges of ragging. This resulted in other students protesting against the suspension but not against ragging. In another instance, seven Kelaniya University students were arrested in May last year after a female student complained to the police that senior students had subjected her to inhuman ragging just because she wore jeans against their “orders”. Indicating where student groups stood in respect of this inhuman practice of ragging, they took to the streets demanding the immediate release of the arrested students. There are several cases of Sri Lankan students joining private universities abroad to avoid the ragging at local universities. But without regretting what compelled students to join private universities, the student unions are agitating against private universities in Sri Lanka. According to reports the Police have taken steps to charge the Galaha torturers under the Anti-Ragging Act. How did the police define this shameless crime as a case of ragging when it occurred in a rented house outside the university? Unless student unions come forward to help eradicate this menace from universities it is the duty of the people to further isolate the political parties that support these unions at future elections. It is also important for the law to be applied in the university premises in its harshest form because that is what people expect after reading about the inhuman treatment meted out to the freshers by senior students in a house at Galaha last week. What was once a "sportive initiation" has deteriorated to almost heinous crime bordering on organised crime of the underworld with hideouts ,funded may be by the sadististic patrons, in society ,in political party/parties as their voting and parading flocks far removed from what is expected of the creme la creme of our country.It is high time the civil society moves in for the university authorities no longer the independent academia ,the education authorities no longer drawn from the independent public service even the ministry remote controlled by unseen forces and so on and so forth.